Taiwan's Nov. 29 local elections in the books, Taiwan is already gearing up for national elections in early 2016. In the run-up, the country's major parties will likely square off over constitutional reform and resource allocation. The "Ko Wen-je whirlwind" is without doubt the most important phenomenon associated with the recent elections. Once Ko officially assumes his post as mayor of Taipei on Dec. 25, the whole nation will closely scrutinize his every move. Will the new political style that Ko promotes be able to truly bridge the political divide between the blue and green camps? Will Taipei become a politically neutral "demilitarized zone" as Ko has promised? Ko commands already considerable influence among younger voters. Should the politically independent mayor be able to create a new political atmosphere and build a good track record during his first year in office, he is bound to become more popular than the party leaders of the "blue" ruling Kuomintang (KMT) and the major opposition "green" Democratic Progressive Party (DPP). Ko's potential influence on the 2016 presidential elections must not be underestimated. The new political culture that Ko has initiated will most likely leave its mark everywhere including on the economy, society and culture. Moreover, Ko's successful appeal for civil participation in politics will also encourage civic groups and other voices representing a third form of power. In the coming year, it's worth watching whether civic participation and people power can make themselves felt in the political atmosphere in the wake of the whirlwind caused by Ko's rise to power. Following the Nov. 29 local elections, New Taipei Mayor Eric Chu, who is the only candidate to run for KMT chairman, was the first to bring up the idea of amending the Constitution to change Taiwan's semi-presidential system into a parliamentary system. While DPP Chairperson Tsai Ing-wen responded to Chu's overture by calling for a "National Affairs Conference," President Ma Ying-jeou invited Tsai to discuss the matter one-on-one. Clearly, constitutional reform will be on Taiwan's political agenda next year. When Chu takes over as KMT chairman in late January, the KMT and the DPP will formally start to fence off over constitutional reform. Which political system suits Taiwan best, a presidential, a semi-presidential or a parliamentary system? Can constitutional amendments pertaining to parliamentary reform and multiparty democracy find a majority in the legislature? Should the voting age be lowered from 20 to 18? When should these constitutional reforms be implemented? Such questions will touch raw nerves with the KMT and the DPP. Still, while constitutional reform might dominate public debate on the surface, behind the scenes, the political heavyweights in both blue and green camps will strive to position themselves well for the upcoming elections. They need to not only integrate their party machineries and support bases vertically and horizontally, but also must solicit support from civil society and the younger generation. It is foreseeable that they will take frequent and varied actions toward that aim. After Ma appointed incumbent Vice Premier Mao Chi-kuo as the new premier, he reshuffled the Cabinet only slightly to the widespread disappointment of an electorate that had hoped for a fresh political wind. Nevertheless, the new Cabinet continues to distribute small tangible gifts such as price reductions for gasoline, electricity, sugar and public transportation. These moves all highlight the president and Cabinet's determination to make a last stand. The recent elections clearly showed that economy-oriented voters have not disappeared from the electorate, but these voters, who solely emphasized economic growth in the past, now attach importance also to the distribution of economic gains. The issues that young people care about most - land justice, residential justice and generational justice – have already become the main topics of contemporary civil society. Against this backdrop, voters will pay close attention to the fate of two government policies that pertain to the wealth gap and people's sense of relative deprivation: one is the planned postponement of a stock gains tax on investors who trade more than NT$1 billion worth of shares in a single year. The so-called "big shareholder regulation" was adopted two years ago and was originally scheduled to take effect on Jan. 1. In a committee meeting on Dec. 17, legislators approved a measure to postpone the tax for three years that must still be passed by the full Legislature, and expectations are that it will. It also remains to be seen whether the other, an overhaul of how capital gains on property sales are taxed to discourage real estate speculation, will be decided as scheduled in February. In both cases, the government's stance will be crucial to winning back public support. Should the Ma administration bow to pressure from the rich and interest groups, failing to muster the resolve to turn over a new leaf, it will again pay a high price for misjudging the situation. Focal Point No. 4: By-elections to Trigger Pendulum or Domino Effect? As a prelude to the 2016 elections, five areas (Taichung City, Changhua County, Pingtung County, Nantou County, Miaoli County) will hold by-elections for five legislative seats in February. The outcome of the by-elections will indicate whether the political climate favors a pendulum effect or a domino effect in the wake of the KMT's unprecedented debacle in the local elections. Should the pendulum swing back, it would mean that blue camp supporters and middle-of-the-road voters will give the humiliated KMT another chance in the 2016 presidential and parliamentary elections to prevent the green camp from gaining power from the local level all the way to the central government level. A domino effect would allow the green camp to extend its winning streak to the presidency and the Legislature so that even KMT lawmakers would have to fear for their political future. Should the blue camp be able to solidify its position in the by-elections, it might be able to stem the tide or even create momentum for the pendulum to swing back. On the other hand, should the green camp triumph in the by-elections, momentum for a domino effect will continue to build in the coming year, and the blue camp will face even more of an uphill battle in 2016. Although the cross-Taiwan Strait agreement on trade in services has run aground due to Taiwan's Sunflower student movement, Chinese leaders refrained from interfering with the local elections. Given that public sentiment in Taiwan is not favorable to the KMT, will Beijing try with all means to give the blue camp a shot in the arm during the coming year? Or will it take a wait-and-see attitude to create room for interaction with the green camp, just in case the DPP wrests back power? The blue and green camps both pay close attention to Beijing's moves. It cannot be denied that for many middle-of-the-road voters, a political party's ability to handle relations with China well is still an important factor in deciding whom to vote for. Both the blue and the green camps need to face important issues in the coming year: Can the Ma government effectively convince voters that a speedy passage of cross-strait agreements on trade in services and trade in goods is important and necessary? Will the green camp be able to demonstrate a pragmatic and reasonable attitude as it prepares to return to power so that middle-of-the-road voters develop trust in the DPP? On the eve of the previous presidential elections, several influential Taiwanese entrepreneurs strongly advocated the "1992 consensus." Their statements were seen as a driving force behind Ma's reelection. During the Sunflower student movement, however, hundreds of thousands of protesters in black T-shirts took to the streets to stop the passage of the trade in services agreement with China. These demonstrations were regarded as people power and as an important symbol of the younger generation's opposition to the government's China-leaning policy. 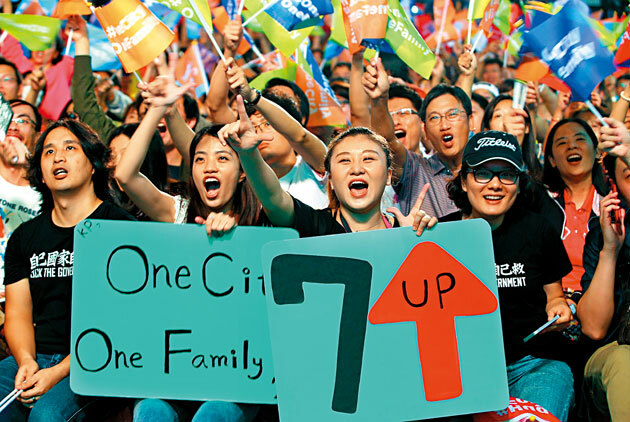 During the next 12 months, the "China factor" that continues to lurk behind a number of major public issues will become a core factor in influencing political and economic developments in Taiwan.